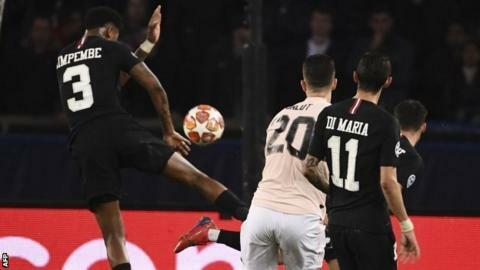 Uefa has backed the video assistant referee system's decision to award Manchester United an injury-time penalty that knocked Paris St-Germain out of the Champions League. Diogo Dalot's shot hit Presnel Kimpembe's arm but was only deemed a spot-kick after the VAR intervention. Injured PSG forward Neymar called the decision a "disgrace". But Uefa said the distance the ball covered was "not short" and Kimpembe's arm was "not close" to his body. The handball rule - what is the latest, and do you agree? When will Solskjaer get the Man Utd job full-time? Based on this, it added that "the impact could therefore not be unexpected" and "the defender's body [was made] bigger thus resulting in the ball being stopped from travelling in the direction of the goal. "The referee, therefore, awarded a penalty kick. "Given that the referee did not recognise the incident clearly during live play [referred to as serious missed incident in the VAR protocol] an on-field review was conducted." After a lengthy delay where Slovenian referee Damir Skomina conducted the review on a pitch-side monitor, Marcus Rashford scored the penalty to earn United a 3-1 win on the night and send them through on away goals. It was the 21-year-old's first competitive spot-kick for his club and ensured that Ole Gunnar Solskjaer's team became the first in Champions League history to overturn a 2-0 deficit from the home leg in a knockout tie.